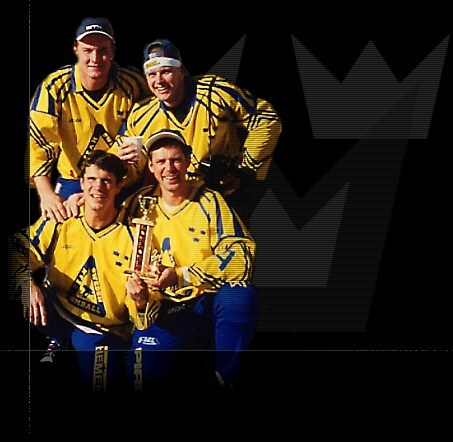 In November the fifth 1999 did Team Sweden Killerbees leave Sweden to participate in "The Las Vegas Crapshot Broomball Tournament". Mick Sletten, Yvan "Skip" Breton and the defender Toran Enar. This was a part of a cooperation between the Swedish Broomball Association and STX. The goal with this is to develop Swedish and European Broomball and strengthen the bonds across the Atlantic. This gave us also the possibility to play with some new and fine equipment as the Acton Shoes and the STX CU 31 Killerbee stick. (and could) play much better than this if we should take any points. The next game did we won quite easily against Ottowa. They didn't show up at all and we got two points. This wasn't the way we wanted to win, but it gave us a place in the semi-finals. Now was our goal to take the second place in the group. But in order to do this we had to beat at least one team more. Our next game was against California and now did everything go as planned. We played really well and in his first change on the ice, did Johan Wikstr�m score 1 - 0. After 15 minutes he had scored two more and made a real "hat trick". When the game was over, did the score-board read 5 - 1 to the Killerbees. Everyone had played at their top and especially "Skip" where outstanding. If we now beat Calgary did we finish second and would, in the semi-final, meet the team who came on the fourth place. When we entered the ice at 9.00 AM, there where no sign of the Calgary players. This meant that we won on WO once again. This was no fun at all. We had travelled all the way from Sweden to play Broomball against good competition, - not to train with each other. That we could do a lot cheaper in Sweden. Who to blaim we really don't know, but the result was however that our opponent in the semi-final was to be Calgary. This was to be a tough and thrilling game. With 2 - 1 to Sweden and 60 seconds remaining of the game did Calgarys goalie enter the bench, and with only 30 seconds remaining did they hit the post. But when the match finally was over had the Killerbees scored twice and Calgary just once and we where in the final. Our opponents in the final was to be Minneapolis (once again). This time we had decited to really give them a fight. We had everything to win and nothing to loose. And the team played really well. 1 - 0 from zero angle and after a fantastic solo show. best and gave Minneapolis a rough time. But with 10 minutes remaining of the game, they scored via one Swedish leg. Now it was 1 - 1. Slowly the initiative went over to the americans and soon they scored again behind the goalie J�rgen Kjellberg and it was 1 - 2. This didn't look good for us. With one minute to go did our goalie enter the bench and we where six against five. The Killerbees had several chances to score, but when the whistler blew, the score-board still showed 1 - 2. Even if it never feels good to loose with just one goal, did everyone agreed that we had done well. The wonderful reception we recieved from all the American and Canadian players made us really feel welcome. Hopefully will we in the Killerbees give some contribution in some way to the development of Broomball in the future. Our next tournament was planned to bee the Challange Cup 2000, but due to problems with the finances we were forced to stay at home. But fortuantly there are more tournaments to come and we will do our best there to cause trouble for the other teams even later on.